Merlyn and Rob Lewis proudly holding the new Clown Prince scepter. A love of craftsmanship and woodworking seem to run in Merlyn Lewis’s family. 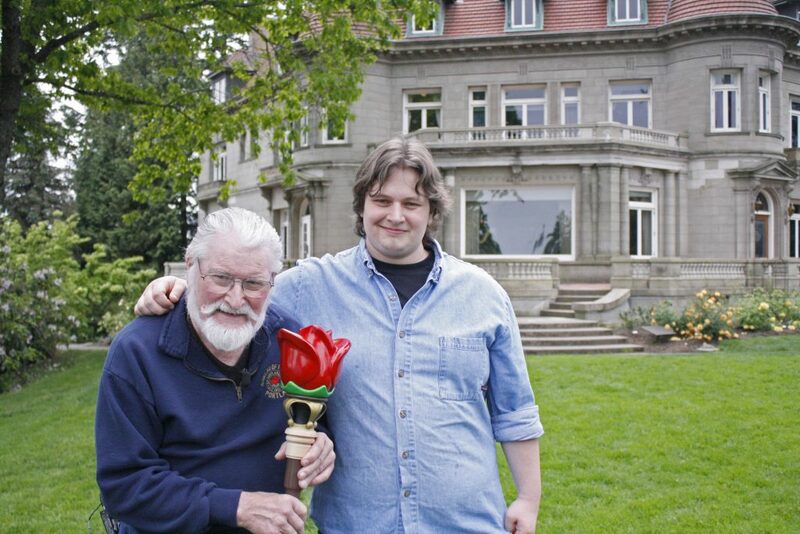 Merlyn helped restore Pittock Mansion 1964-65, and this year his grandson, Rob Lewis, worked with the Rose Festival to create the new Clown Prince scepter. As a nod to Henry and Georgiana’s roles in forming the Rose Society and the Rose Festival, Rob used a piece of wood left over from Pittock Mansion’s restoration (see the blonde wood near Merlyn’s hand). Merlyn had the wood in his woodshop scrap pile for over 50 years before the scrap found its home in the new Clown Prince scepter. KPTV anchor Laura Rillos-Wood met Merlyn and Rob at the mansion to preview the new Clown Prince scepter and interview Merlyn about his time working on the mansion over 50 years ago. As Merlyn and Laura toured the house, Merlyn shared memories of his experience working on the restoration.